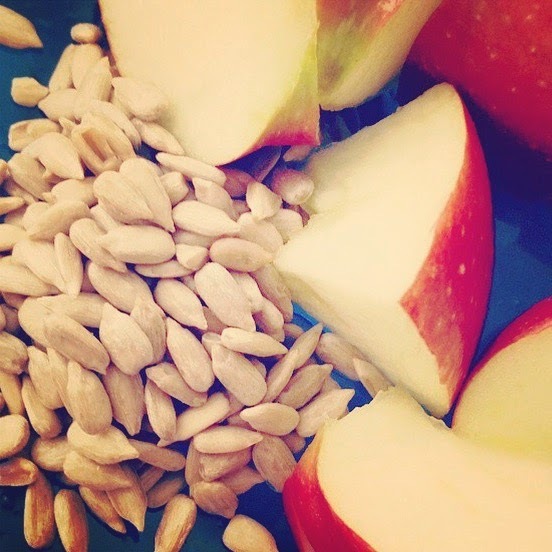 Fit Fluential Mom: 55 Snacks Under 150 Calories! Eating healthy doesn’t need to be complicated or boring! Here are 55 easy-to-prepare snacks, each under 150 calories, that will keep your taste buds happy. Spread ¼ cup of nonfat refried beans on a small tortilla. Top with shredded lettuce, diced tomato, and a sprinkle of your favorite cheese. Freeze 1 cup of grapes and enjoy them as if they’re sorbet. Mix one teaspoon of honey into half a cup of plain, nonfat Greek yogurt. Sprinkle an apple with cinnamon for a treat that tastes more decadent than it is. Dip 4 or 5 (depending on their size) strawberries into 2 squares of melted dark chocolate. Try 1 cup of unsweetened applesauce with a hint of cinnamon. Chop one and a half cups of jicama and add a splash of lemon juice and a pinch of salt for a tangy, refreshing treat. Enjoy 8 ounces of skim milk with a shot of espresso. Crunch on 9 or 10 baby carrots with a side of 2 tablespoons of hummus. A handful of 25 pistachios, 14 almonds, or 16 peanuts makes for a nice “good” fat and protein snack. Hard boil an egg and replace the yolk with 2 tablespoons of guacamole for a protein-packed snack. Boil or steam one-half cup of unshelled edamame with a pinch of salt for a fiber-rich snack. Enjoy 1 large block or 3 small squares of dark chocolate. Dice one medium tomato and top with 2 tablespoons feta cheese and a pinch of salt. Make your own kale chips for a fraction of the price with this recipe. Drizzle 2 tablespoons of balsamic vinegar on top of 2 cups of sliced bell peppers. Scramble 3 egg whites with one-half cup of raw spinach and 1 Tbsp. of feta cheese. Coat one-half of an ear of corn with a 1 tsp. of olive oil and 1 minced garlic clove. Grill until tender. Combine one-quarter cup black beans, ¼ teaspoon of salt, and 1 Tbsp. of nonfat Greek yogurt for a hearty snack. Dip one-half of a banana into 2 squares of melted dark chocolate. Top one ounce of mozzarella cheese with half a cup of cherry tomatoes and 2 teaspoons of balsamic vinegar. Mix together 2 ounces of water-packed tuna with 1 teaspoon of extra virgin olive oil and 1 teaspoon Dijon mustard. Enjoy one small baked sweet potato plain or with a pinch of salt. Munch on 2 cups of air popped popcorn. For a salty snack, enjoy 9 kalamata olives. Top 1 cup of watermelon with 2 tablespoons of crumbled feta. Even on its own, peanut (or almond) butter makes for a treat full of good fats. Combine three-quarters of a cup of melon with one-quarter cup of nonfat cottage cheese for a sweet dessert. For a savory and sweet salad, mix together 1 cup of baby spinach with one-half cup of sliced strawberries. Drizzle with 1 tablespoon of balsamic vinegar. Mix one-half serving of your favorite flavor of Shakeology with water. Mix ¾ cup nonfat cottage cheese with a pinch of chili powder and a pinch of curry powder. Top with chopped scallions if desired. Dip eight medium-sized cooked, peeled shrimp in 2 Tbsp. all-natural cocktail sauce. Top a Wasa whole-grain cracker with 1 ounce of salmon lox, two slices of cucumber, and a pinch of crushed black pepper. Wrap three slices of lean, nitrate free deli ham around three cooked asparagus spears. Spread 1 Tbsp. of hummus on a whole grain rice cake. Top with two cucumber slices. Mix two grated carrots with one Tbsp. of raisins, one tsp. of raw sunflower seeds, and 2 tsp. balsamic vinegar. For a snack with protein and fiber, mix ¼ cup drained black beans, one chopped tomato, half a green bell pepper chopped, and a pinch of chili powder. Spread 2 Tbsp. hummus on a whole-grain Wasa cracker. Top with one jarred roasted red pepper, sliced. Mash ¼ avocado with a squeeze of lime. Spread on a Wasa cracker and top with a pinch of espelette pepper or smoked paprika. Combine 16 shelled pistachios with ¼ cup unsweetened dried cranberries. Enjoy ranch dressing without the guilt! Dip 10 baby carrots and 8 cherry tomatoes into 2 Tbsp. healthy ranch dip made with Greek yogurt vs. mayo or sour cream! Roll half a peeled banana in one Tbsp. chopped peanuts, pressing so that nuts stick to the banana. Freeze. Enjoy! Bake your own apple chips and you can enjoy them with much less sugar. 1 package of roasted seaweed snacks from Trader Joe’s or your local supermarket. Cut up 4 celery stalks and enjoy them with ¼ cup salsa. Cut up 4 celery stalks and dip them in 1 tbsp. almond butter. Sprinkle 1 tbsp. nutritional yeast over 2 cups air popped popcorn. Top one slice whole grain bread with 2 slices deli turkey and 1 tsp. mustard. Top one Wasa cracker with 2 tsp. nut butter and 3 sliced strawberries. Cut up one half of a banana and dip it in 2 tsp. nut butter and then 1 tbsp. granola. Mash up one half of an avocado and mix it with 1 tsp. balsamic vinegar. Mash up one half of an avocado and combine with with ¼ tsp. soy sauce, ¼ tsp. sesame seeds, and a drizzle of rice wine vinegar. Whole grain corn tortilla chips with 2 tbsp. fresh salsa.